First off, I want to say thank you to everyone who sent prayers and well wishes my way yesterday. My grandmother made it through surgery fine and is in recovery. The biopsy results won't come back until Friday so we won't know the extent of anything until then. I definitely appreciate all the comments and love, I was pretty nervous about it. Also, if you read my post yesterday you know I had a pretty rough weekend so I apologize in advance for this week's pictures. I definitely wasn't feeling like getting all dressed up so this week is a pretty basic week but I figure since this is my blog-ary (blog + diary... get it?) it's only appropriate that I keep it real, right? You all know my Saturday's are spent in black and gold, well my Sunday's are spent in black and orange! This is easily one of my favorite Cincinnati shirts I own. I've had it for forever and no other shirt can seem to top it. It's so soft and comfy and I love the baseball tee style of it. The material is light enough to wear on a warmer day and perfect for days like Sunday which were warm but windy! 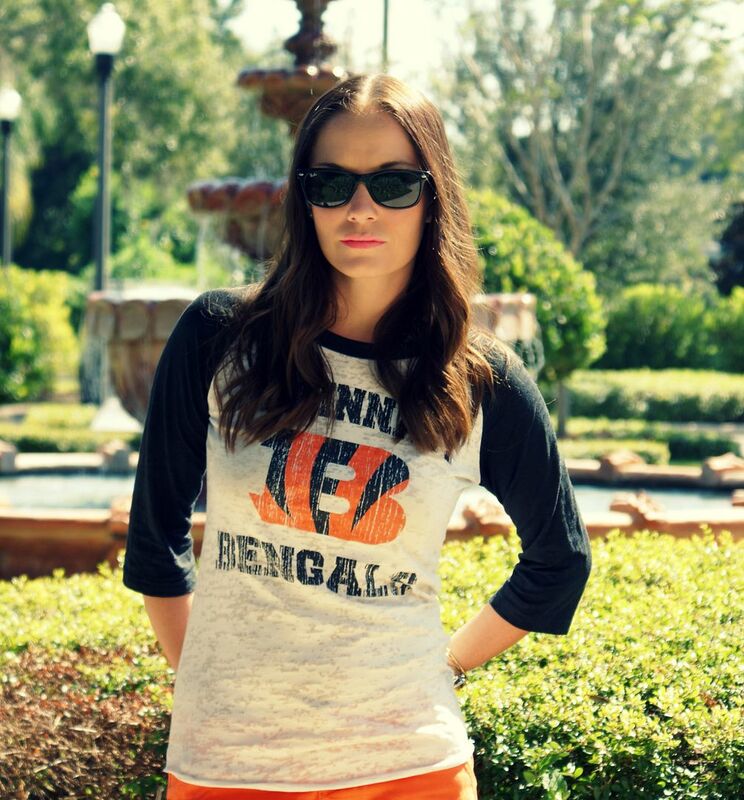 Don't get me wrong, I love wearing my Bengals jersey but there are so many cute team things for girls out there that I just can't help myself sometimes! 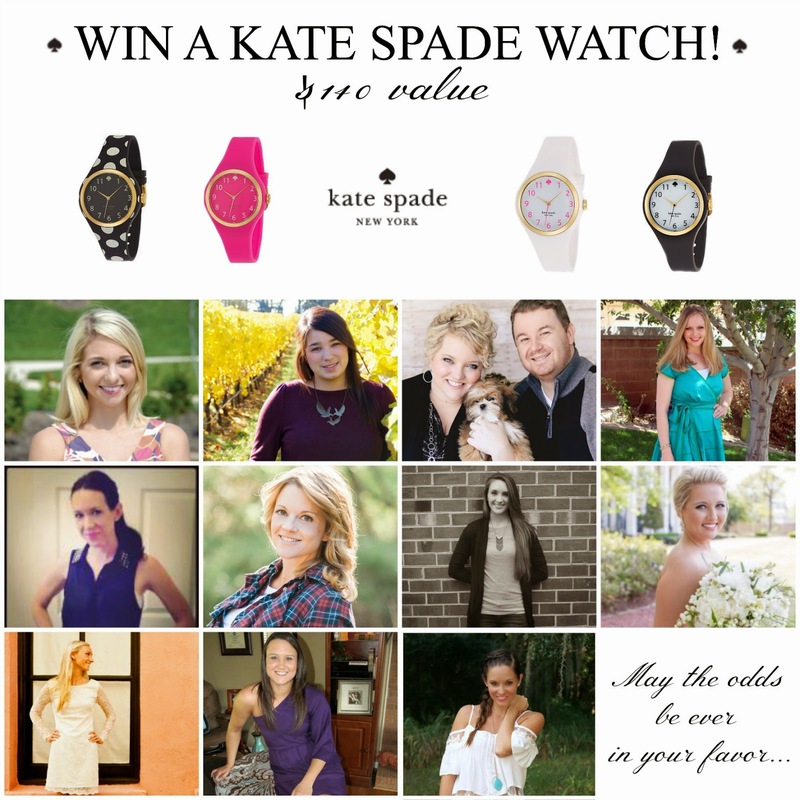 Also, if you haven't already don't forget to enter the Kate Spade watch giveaway! I'm so happy to hear your grandmother came through surgery- sending you lots of thoughts + prayers as you guys wait for the results! You are too cute in this sporty outfit- and yes, amen to keeping it REAL. I LOVE a great, worn in tee shirt... not bought worn in, but worn in from love! Especially if it has an Eagles logo ;) You look so cute and I love this, totally my weekend wear! So glad to hear that your grandma's surgery was successful - I'm keeping you and your family in my thoughts! 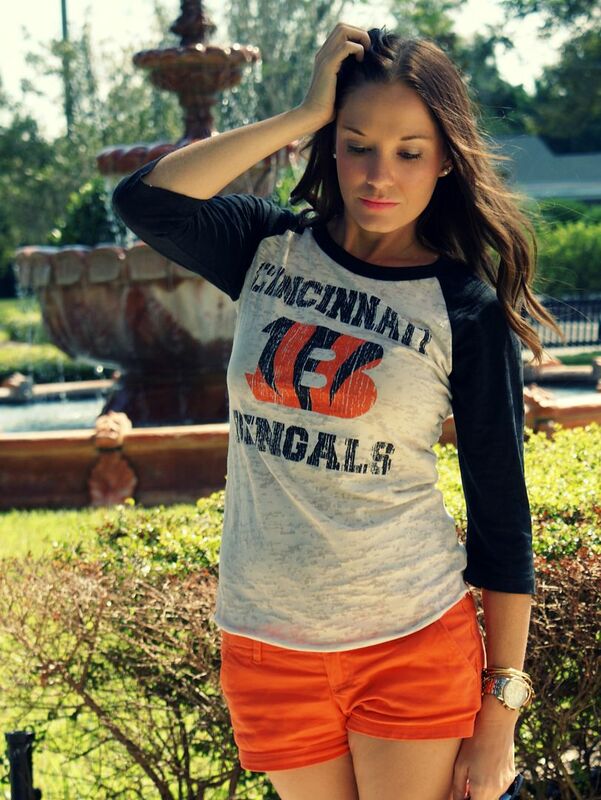 The perfect game day look! And so glad your grandmother is doing okay! I'm so glad your grandmother's surgery went well, keep us updated on how she's doing *hugs*. Glad to hear your Grandma's surgery was a success. Will continue keeping her & the remainder of your family in my prayers! you look so cute! glad everything went well with your grandmother. Love this casual look! And sooo happy to hear everything went well with your grandma. Prayers for the biopsies to come back clear! Such a cute game day look! I love burnout tees. Such a fun football outfit. My husband and I are hoping to go to a Bengals game this year (even though we are Chiefs fan). Seriously too cute! 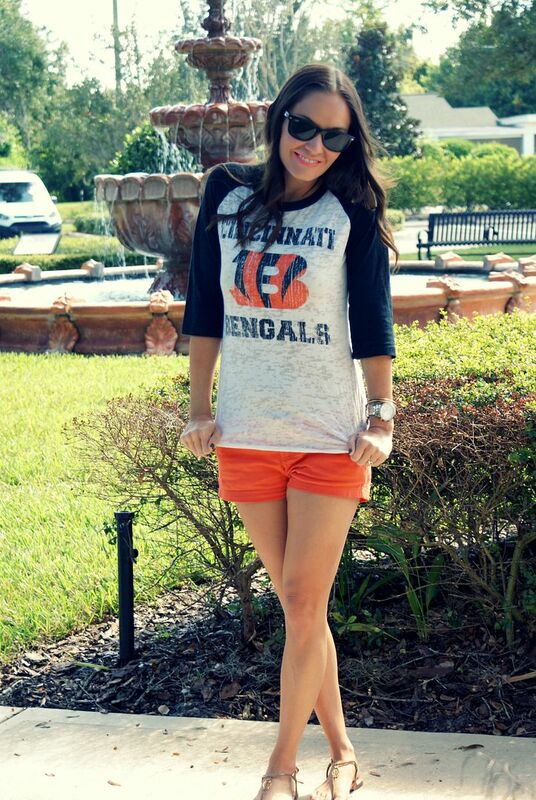 Such a perfect game day outfit! Your outfit is too cute, and looks so comfy! I'm glad your grandma is in recovery, praying everything else goes smoothly for her! You look great in those colors and looks super comfy! Great to hear your grandmother is okay. I will keep her in my thoughts!! And you look stunning, as always! You look so cute in your shorts and matching lip color! Sending hugs for you and your grandmother! i love your simple outfit, that tee is super cute. Love how you paired that top! Too cute! I'm glad your Grandma's surgery went well! I will keep you in my thoughts! You look adorable in your team gear! Glad your grandmother made it through surgery fine! 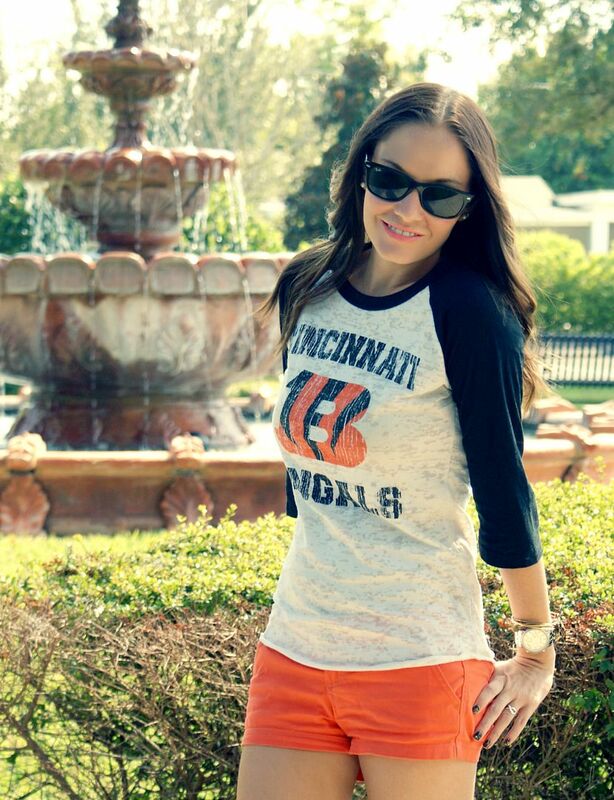 You're looking smoking in this game day outfit! You don't need to apologize! Everyone has a rough time sometimes! I'm glad that everything turned out ok! And for the record, that sitting in front of the fountain photo belongs in a magazine! So glad to hear the positive news about surgery. Such a cute top, too! I love the casual look! I'm glad your grandmother is doing well. I'm so happy to hear girl that your Grandmother is recovering from the surgery! Also I really wish I started designing women's football gear like 10 years ago.....when all we had to wear was just little boys jerseys! You look gorgeous in those pictures girl! <3 to you and that shirt is fabulous! I love this more casual outfit! I haven't read your previous post yet, but so glad to hear your grandmother's surgery went well Hoping she's doing well, I will keep her in my prayers.